Marius just completed Honeybee Democracy by Thomas D. Seeley. Check back regularly for what Marius is reading and writing about! Lives lived indoors, cramped and strangers to the sun. And our own as well. Never too early for a call-out! 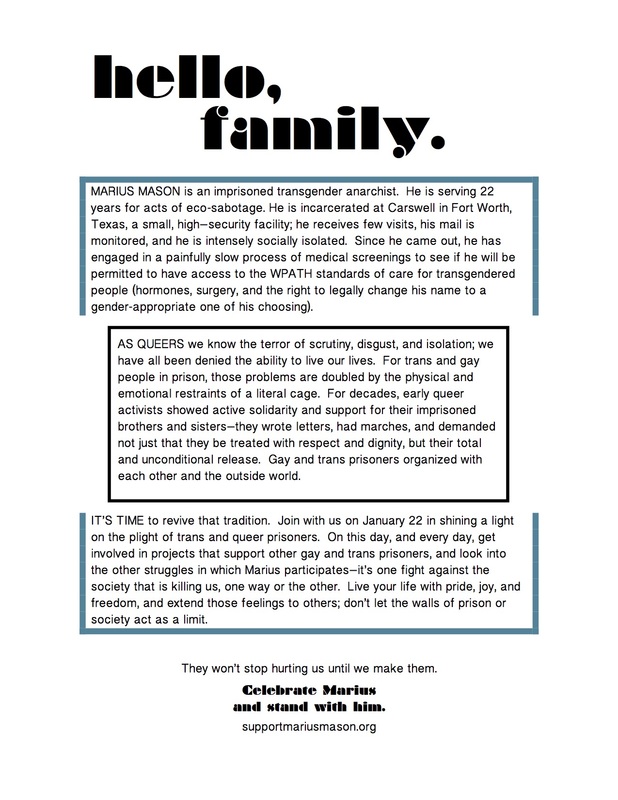 Marius and friends are organizing events to take place January 22nd to support queer and trans prisoners. Support Marius by supporting others! Let us know if you want to do an event and we’ll send you materials. 4) Michael Kimble is up for parole in December and we are trying to get people to write letters to the parole board on his account. Michael is a gay, black anarchist imprisoned in Alabama since 1986 for murdering a racist homophobe. 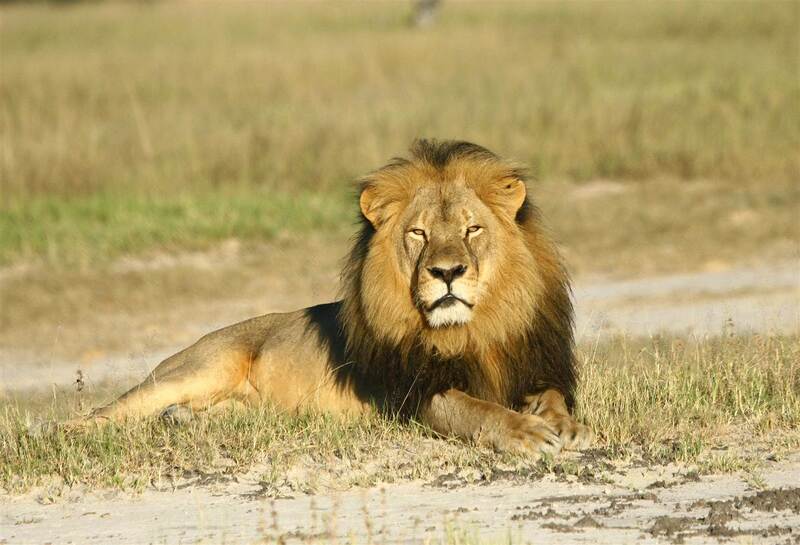 He has been active for much of that time in prison organizing and rebellion. In recent years, he has been involved in hunger and work strikes in Alabama, working with the Free Alabama Movement. Michael has suffered severe consequences for his uncompromising attitude, including numerous stints in solitary (where he currently is held). Despite this, he remains committed to struggle against prison and the state. Please, if you can, write the parole board and help get Michael free. Also, please spread this information using whatever media have available to you. Here’s a link to Michael‘s website, with a write-up on how to support his parole. 5) On Wednesday, August 12th, long term political prisoner, Hugo “Yogi Bear” Pinell was murdered. The context for his murder remains unclear, save for the fact that it happened in the midst of a prison riot. In the early 1970s, while imprisoned in San Quentin State Prison, Hugo Pinell made contact with revolutionary prisoners such as George Jackson, one of the Soledad Brothers, and W.L. Nolen. On August 21, 1971, there was a prisoner uprising in Pinell’s housing unit at San Quentin, led by George Jackson. On that date, Jackson used a pistol to take over his tier in the Adjustment Center. At the end of the roughly 30 minute rebellion, guards had killed George Jackson, and two other prisoners and three guards were dead. Of the remaining prisoners in the unit, six of them, including Pinell, were put on trial for murder and conspiracy. Together, they were known as The San Quentin Six. Three of them were acquitted of all charges, and three were found guilty of various charges. Pinell was convicted of assault on a guard. For more on Hugo Pinell’s life and death see this excellent article from the San Francisco Bay View. 6) Be sure to check out the latest Political Prisoner/Prisoner Of War every-other week update by the NYC-Anarchist Black Cross. There are lots of important updates on many political prisoners. This one includes updates on Jeremy Hammond, Barrett Brown, Memorials for Hugo Pinell, poetry and more. LGBTQ prison abolition group Black & Pink began publishing letters from inmates in solitary confinement last month in an effort to shed light on the abuse and harassment they suffer. 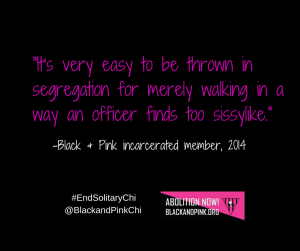 In a post introducing the series on their website, Black & Pink explained that last summer, their Chicago chapter contacted to over 100 inmates in isolation to ask for their experiences. They received nearly 40 responses, mostly from the Illinois Department of Correction and Marion federal prison. The true number of queer and trans inmates in solitary confinement is basically unknown. 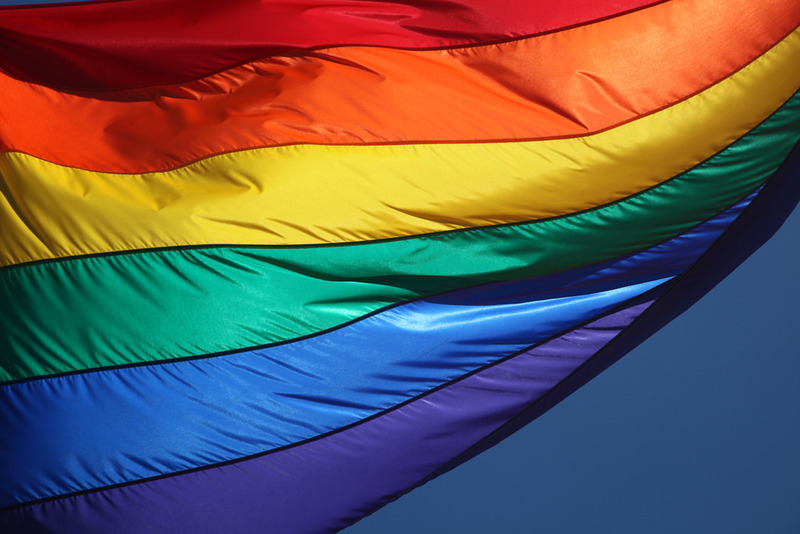 In addition to being subject to administrative segregation, punitive segregation and ‘therapeutic housing,’ many LGBTQ prisoners are placed in protective custody, in which they are moved to isolation to supposedly protect them from harm and harassment by other inmates. Protective custody figures are not included in tallies for solitary confinement. It’s very easy to be thrown in segregation for merely walking in a way an officer finds too sissylike. I’ve been thrown in segregation because an officer felt my fingernails were too longs and girlie. My friend was thrown in segregation cause her eyes were lined. Sixteen percent of respondents to the National Transgender Discrimination Survey Report [PDF] said they had been incarcerated “for any reason,” compared to less than three percent of the general population who said they had been incarcerated “at some point in life.” Seven percent of respondents to the survey said they had been arrested and incarcerated by law enforcement solely on a basis of their identity and sexual orientation. The Bureau of Justice Statistics found that between 2011 and 2012, “inmates who reported their sexual orientation as gay, lesbian, bisexual, or other were among those with the highest rates of sexual victimization.” That study [PDF] found roughly 12 percent of LGBTQ prisoners and over 8 percent of jail inmates reported being “sexually victimized” by another inmate, with an additional 5.4 percent of prisoners and 4.3 percent of jail inmates victimized by staff. 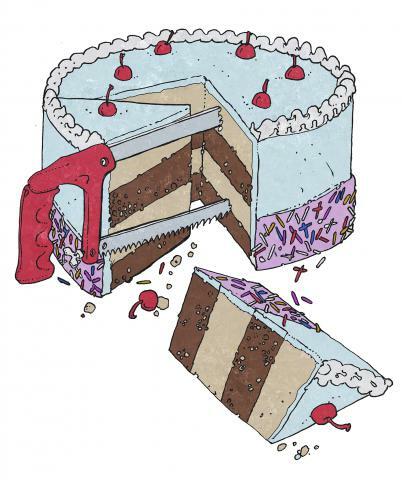 The abuses faced by queer and trans prisoners — particularly those who are black or brown — deserve far greater attention. I look forward to the rest of this series and reading the first hand experiences of trans and queer inmates in isolation.